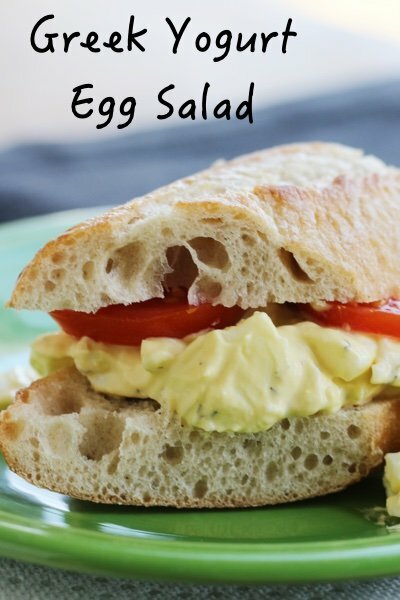 Have you ever made egg salad with Greek yogurt? Recipes are just like music – they evolve over time. 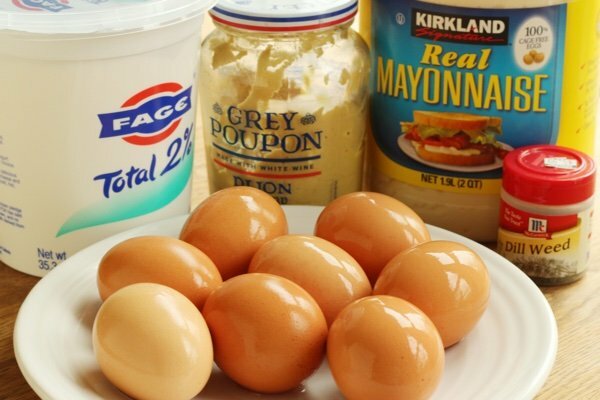 Egg salad is a perfect food for updates because using a ton of mayonnaise in anything is currently out!. It is also the perfect food because it is inexpensive and easy to make. Greek yogurt wasn’t really around when I was a kid and we all know it is a huge hit because of its thickness and additional protein when compared to regular yogurt. Replacing the mayonnaise with Greek yogurt does three things. It brings the calorie count way down, adds more protein, and, I would argue, makes it more delicious than the original version. I have replaced the mayo with Greek yogurt in my healthy buffalo chicken dip recipe and my lighter Caesar dressing without the mayo recipe. Both of these options are really good. You don’t notice that you have changed out the fattier stuff. You can add anything else you want to this to spice it up. A dash of Tabasco, parsley, chopped celery, pickles, and green onions are all easy and delicious additions. I like to eat my egg salad with a fork over a bed of lettuce with a slice of 100% whole wheat bread on the side. This way, I eat more vegetables and go lighter on the carbs. If I am taking this in a lunch box, I ALWAYS pack my bread on the side so the sandwich doesn’t end up soggy – yuck! This recipe uses Greek yogurt with 2% fat. If you have non-fat – that will work as well. I think that the additional fat in the Greek yogurt makes it less chalky. I know plenty of people who won’t eat Greek yogurt because it has a chalky texture. The best way to avoid that problem is to eat the version with some fat in it. 1. 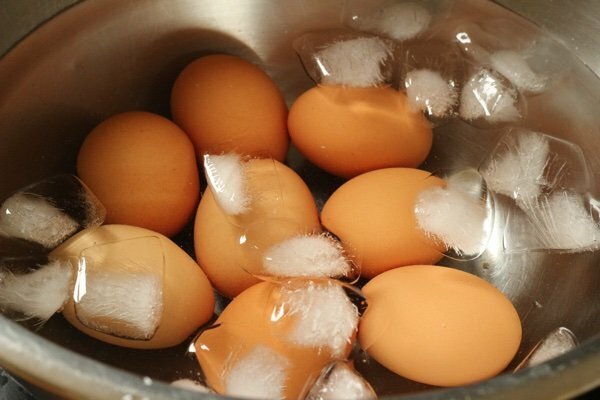 Use eggs that have been in your fridge for 10 days - old eggs are easier to peel. 2. 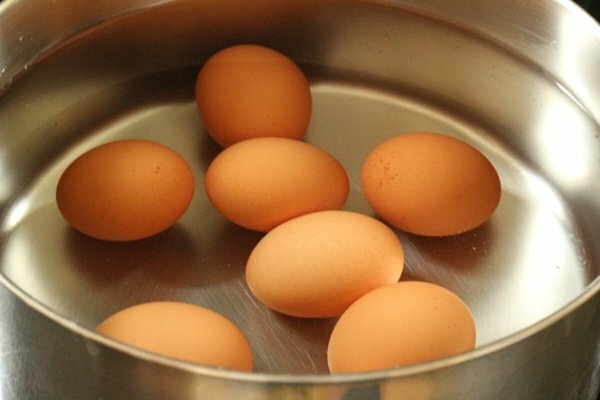 Place eggs in a saucepan and cover with 2 inches of water. Heat to a boil, turn off the heat, and leave the eggs in the pot (covered) for 13 minutes. This seems to be the magical number - 13!! 3. Set up an ice bath and transfer the hot eggs into the cold water. Leave them there for 5 minutes and then peel. I bang my eggs in a circle, cracking all the peel before I attempt to remove it. I find that this boiling method makes quick work of egg peeling. 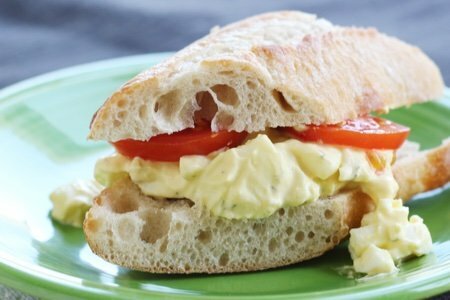 This egg salad is simple to prepare because all you do is put the eggs in a bowl with the yogurt, etc. and MASH. The eggs out of the water bath are soft (not rubbery) so they mash easily. I keep this in my fridge and eat it all week for lunch (unless my children find it - they seem to like it). Place eggs in large sauce and cover with cold water until they are immersed. Bring to a boil and cook for one minute. Cover and remove from heat. Leave for 10 minutes and then drain. When eggs are cool, peel them. In a large bowl place peeled eggs, Greek yogurt, mayonnaise, mustard, and dill. Using a potato masher, roughly mash and mix eggs until you have your desired consistency. Add salt and pepper to taste. Serve over lettuce, on bread, in a pita, on crackers or alone. Store in refrigerator for five days. Lighter Caesar Dressing: Yes You Can! Sounds great, but I'd throw some celery in there too. Looks yummy ... haven't had egg salad in forever. You can do the same thing for tuna ... one of the WW recipes uses greek yogurt and a bit of light mayo - since a whole can of tuna has only 1 Points Plus, it brings the total points/calories way down. (I usually add Tastefully Simple Onion, Onion. ), and eat it on a sandwich thin. Looks great! I will have to try this one. I agree 100% with the chalky greek yogurt thing. I have a very hard time finding Greek Plain 2% yogurt, so I usually have to buy the 0% and then add in a Tb or two of sour cream or mayo to my dips (for savory recipes) until the chalkiness is gone. For sweet recipes I like to add some whip cream to the top (which makes it more fun and yummy at the same time!) I do prefer the 2% but I guess there's not enough demand for it in some places. Goodness! Love Greek yogurt! Use tortilla instead of bread with sliced lettuce and chopped onions plus jalapeño... Mmmm! To reduce Weight Watchers SmartPoints, I use Fage Greek yogurt & cottage cheese (both fat-free) in dip mixes and egg, tuna, fruit, & green salads. Fage 0% is creamy and doesn't taste chalky to me. I agree with C that Fage 0% yogurt doesn't taste chalky. I always use either that or Fage 2% in my egg, chicken or tuna salad. I also use greek yogurt in place of some of the mayo in deviled eggs and creamy slaw. So good with a much "fresher" flavor! I usually use Dannon Fat-Free Plain yogurt. Greek yogurt is just thicker, less whey. If you put your yogurt into a cheesecloth bag, hang it from your kitchen faucet, or put it in a sieve or colander and drain it for a few hours, you have Greek yogurt. If you drain all the liquid from the yogurt, you end up with yogurt cheese. Put the boiled egg in a glass jar with a lid. Shake the jar. The shell will be smashed and will come off in an instant. For years I've made my egg salad with low fat cottage cheese. I mix in a little celery or celery seed and a little yellow mustard. So good. Add a pinch of horseradish to your egg salad and top it off with avocado, sprinkle with turmeric and sea salt....so yummy! I always loved a big egg salad sandwich 'n soup night! So going primarily Whole Food Plant Based last Fall, I just had to find a good substitute. 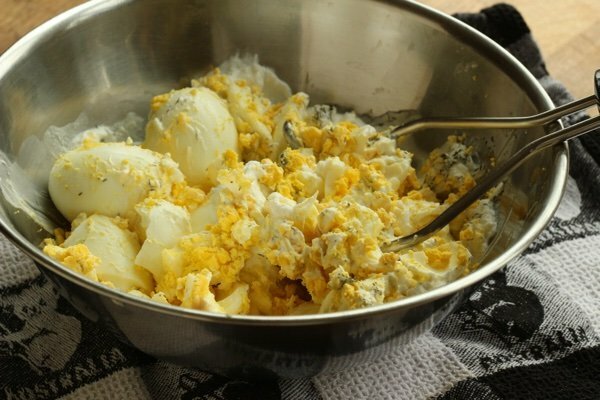 Has anyone tried eggless ‘’egg salad’’? This mock version is very much like the real thing. If anyone else is interested in going eggless, here is what I use: 1 pkg. firm tofu, drained and rinsed, vegannaise, tsp. lemon juice or cider vinegar, Tbsp. Dijon mustard, tsp. cayenne pepper, 1/2 tsp. turmeric, chopped fresh Italian parsley, chopped fresh dill, diced scallions. Mash the tofu in a bowl, leaving some texture. Mix in the remaining ingredients. Chill half an hour before serving. Makes 4 hefty delicious sandwiches. I think all the add-ins really bring it to life! I LOVE egg salad. To minimize WW pts, I use Fage 0%, a little fat-free cottage cheese, and minimal fat-free/light mayo - maybe a tablespoon, just enough to counteract the sourness of the yogurt and to retain that egg-salady flavor! I'm astounded that you boil your eggs for 13 minutes. Even the gold standard 7 minutes can be too long. I typically do a 5-minute rapid boil, then remove from heat a coupla minutes. They come out perfect, all yellow, with none of that slightly overdone green film around the yolk! Good one Lisa, I'll try the yogurt recipe. I sometimes add avocado to my egg salad and it is delicious together. I Might Not Be Serving The Item Everyday. For RC - cholesterol is hereditary. Dietary cholesterol has only a minute affect on cholesterol. The body manufactures it no matter what you eat. The cholesterol in eggs is o.k. The vitamins and minerals are in the yolk and are the most valuable part of the egg. Look at the "new" scientific data from university and medical research and papers. This thinking that the egg is a problem is very archaic by today's standards. "cholesterol in food has a smaller effect on blood levels of total cholesterol and harmful LDL cholesterol than does the mix of fats in the diet. [2-4]"
"research has shown that most of the cholesterol in our body is made by our liver-it doesn't come from cholesterol we eat. The liver is stimulated to make cholesterol primarily by saturated fat and trans fat in our diet, not dietary cholesterol." I eat eggs almost every day, I am 67 and my cholesterol is perfect and low. I am also diabetic. Eggs are not the culprit. Love the side of bread idea. Cottage cheese is a great tip, too. I add a dash or so of lemon juice and capers. IFortuna; Thank You For The Information. I Was Recently Diagnosed With It. I Am Learning About It. Your welcome RC. My advice is to always check with your doctor about your diet and medications. Best of luck to you.